Impactful. Unifying. Hilarious. Informative. Positive. Inspiring. Healing. These are just some of the words that come to mind when I think of the recent B’ney Yosef North America (BYNA) Summit that was held February 12th -14th in Mesa, AZ. The Summit kicked off in a most unique way, giving weight to a well known word, protocol. Among those who attended this gathering were members of the Akimel O’otham and Pee Posh tribes (better known in English as the Pima and Maricopa tribes), indigenous peoples of the American south-west. A time of mutual blessing was offered, gifts were exchanged as a sign of respect for one another, and new friends were most certainly made. When it was time for the speakers, Al McCarn, executive director of BYNA, had the first slot. Al gave a talk on protocol and also something of a “State of BYNA” address, which by the way, is good (but I will come back to that). Al was followed that evening by BYNA elder and House of Aaron leader, John Conrad, who spoke on giving a good report. John laid out a great case on why speaking the words of life and blessing rather than death and cursing are, in part, what should set us apart from the world around us. The next morning brought about a most unique brother, Dr. Suuqiina of Indigenous Messengers. Dr. Suuqiina blended humor (gut wrenching at times) with what Batya Wooten might call, “Deep theology on a business card.” When you wiped away the tears from laughing, you would hear a one or two line theological point that really left you thinking. The afternoon speaker came to us from the Netherlands, Iris Bouwman. Iris, who leads Judah and Ephraim Ministries with long time friend Janny Holster, shared unique insights pertaining to the gathering of all of Israel, how Benjamin is the bridge, and she also shared pictures and stories from her travels around the world. 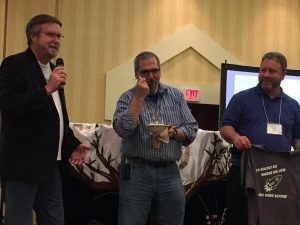 That night, Hanoch Young (United 2 Restore) shared personal insights and observations as related to the many congregations he has visited in the last 3 ½ years. In many cases his experiences among Ephraimites have been positive, but that has not always the case. Hanoch’s talk was preceded by what may have been the funniest skit of the Parable of the Prodigal Son ever done. And somehow, in the 20 minutes of more gut wrenching laughter, the point was made that Ephraim, the Prodigal Son, has had a pride issue he needs, we need, to address. The final morning brought us another talk by John Conrad, the singing of Israel’s national anthem (HaTikvah) and a closing prayer by Mark Webb, an elder in both BYNA and Congregation Living Messiah in Mesa. As one would expect, parting from old and new friends alike was difficult. After each session there were round table discussions where all attendees broke up into groups of 8 and addressed various questions that were provided by a group leader, usually a BYNA elder. The general theme of the discussion was centered on who BYNA is and what BYNA might look like as we continue on the path ahead. I believe each person was able to contribute their own observations and understandings to their groups, but for me personally, there was one main repeating picture that kept resurfacing in my mind, namely, the kind of individual it takes to have ten men coming to you because they believe the LORD is with you. “Grasp the sleeve” is probably better translated, “seize the corner.” It is fairly well accepted that this is the fringes, the tzitziot, the same that was grabbed on Yeshua in Matthew 9:20. However, when it comes to this Jewish man in Zech. 8:23, there has to be more than just the fringes that drew 10 men to him. The fringes are a sign of God’s will, His instructions or Law, but anyone can wear an article of clothing, there has to be more. What about this man was special? What was it that those ten men “heard” about him that they knew that the LORD was with him? We can surmise that this man was walking the walk, speaking life not death, bearing a good report about those he encounters. But I think in every way he must have been a reflection of the one he served. Paul wrote in Colossians 3:17 that all we do in word or deed should be done, “in the name of,” Yeshua. To do something in the name of another means doing it in a manner consistent with his character, in a way that adds to his reputation, or is done in his authority or power. What Paul is saying is that everything we do should reflect the one we serve. The world around us should actually hear the Lord in our words and see him in our deeds and if they don’t, we are not operating in his name. I believe the essence of the Jewish man in Zech. 8:23 is that he is operating in the name, reflecting the character of the one he serves. And in my view, how much of an impact BYNA can have is directly tied to how well each of us as Ephraimites can also reflect the one we serve. If we each can speak life and not death, be edifying and not strife filled, bless rather than curse, and above all… exude the fruits of the Spirit of God in everything we say and do – then we will begin to see lives changed on a scale we have only dreamt about. Beyond what I just shared, the difference between the Jewish man in that verse and anyone else is that he leads a set-apart (holy) life and has the inner peace to handle it. Moreover, he is humble… he knows it isn’t about him, it is about the one he serves and everything he says and does testifies to that. The ten men KNEW the Lord was with him! The state of BYNA is good but there is still a lot of work to do. And most of it is hinged on us better resembling the Jewish man of Zech. 8:23. How much impact we have, how unifying we are, what effect we have on those around us… all intrinsically tied to to the idea that the increasingly dark world around us can and will only get darker, unless we allow the light of God to shine brightly in everything we say and do. >> Check out the BYNA website in the coming weeks as all the talks and events will be offered for sale on digital download. Last January I traveled down near Nashville, Tennessee for the B’ney Yosef North America (BYNA) Plenary Meeting. I went in with real hope but also with great caution as I so wanted to see a group come together that would be geared around the concept of promoting peace and unity among the quickly expanding Ephraimite community. I was cautious, however, because I had no idea what direction this group had envisioned. There were some ideas shared at that meeting that, quite frankly, would have prevented me from becoming a part of this group. Yet, as we continued to discuss things, pray about them, and work together through them, a theme of reconciliation aimed mainly at the growing Hebraic Christian movement began to emerge. I came out of that meeting with a renewed zeal for the work before us and I found myself committed to helping this process in any manner that God would have me. Once we left Tennessee, we began the work of planning a “North American Summit” which was to take place barely three months later. We all had work to do, jobs that needed to be done. Mine was to work on the writing committee to bring forth a set of principles we all could agree to. That became manifest in what is now called, “The Articles of Declaration.” Upon arriving in St. Petersburg, Florida, it became clear, very quickly, that most of the people that were present shared the same vision of promoting unity throughout our house first, before moving on to other work. After almost a couple of thousand years of splits and denominations, the promotion of peace and unity on a body-wide level is truly in its infant stage. With so much division and strife throughout all forms of Christianity, it should be clear to us all that we can’t continue indefinitely using our current model. There is not enough peace throughout our entire body, or “house” if you will, for us to be fully able to touch a holy thing. By that I mean that without sufficient peace within us, we can only profane the holy things we handle. This is a concept that is not comprehended well throughout our house and yet it stands as one of the major problems we have at introducing the well understood ancient teaching of the need to be one in function rather than form. We must develop enough inner peace that we can be surrounded by others that might not see everything as we currently do, and yet, work together without profaning (and destroying) the effort for the good of the whole. One indisputable truth stands before us all: One day ALL of God’s people will stand together as one! Before that time, before the full restoration of all things has come to pass, we simply will not see eye to eye with everyone who is part of the family. Our mission is made clear in Ezekiel where we see him taking the two sticks (one for Judah and one for Joseph) and is commanded to hold them “near” one to another. He doesn’t make them one he simply brings them close and it is after that time that God will make them one in His hand. If all of God’s people are to be drawn close to one another BEFORE the completion of God’s Torah being written in the mind and heart is accomplished, then we will be among people who might not see God or His word exactly as we do. That is just a fact of life that we need to understand and grow comfortable with. This isn’t a position that condones error or false doctrine, it is simply the recognition that until we are perfected, we will stand among imperfection, ourselves included. BYNA might very well play a key role in the days ahead, however, success isn’t likely to come through a political process. Instead, success will come through the people who share the same vision and are united, through God, with a common purpose. I believe that purpose, one of working together toward the reconciliation and restoration of all of God’s Israel, was made clear coming out of that first Plenary Meeting. No longer should we view ourselves as independent little groups, and our more autonomous teachers might consider at least loosely joining this effort of promoting peace and unity through a unified face like BYNA. Instead, we all need to start thinking like the community or body we really are, recognizing that we remain a people dispersed among the nations who need to learn how to get along before we can even consider taking any future steps. We are connected through the same God and His Messiah, however, that Messiah is not returning for the same dysfunctional family that were punished with dispersion to begin with. Rather, he is returning for a family who matured enough to be held near, one to another. Therefore, our first job is in this process is to learn how to live and work together in peace for the good of the whole body. A body, whose head, will be who ushers in the Kingdom and brings with him the exiles who have been away from home for far too long. And so as we head toward the second BYNA Summit which will be held February 12-14th in Mesa, AZ, we find ourselves standing again at a place in history where, like so many moments before us, our direction might very well be steered if ever-so-slightly, into a direction that will, one day, truly change the world. The question is, are we willing to follow God’s lead and work through this process that might last a generation or more… or has our fly-by “in the second” culture gotten the best of us? Can we work within the structure of God’s timetable, or has our society sped up to the point where we can barely even hear that soft, still voice? I, for one, stand optimistically and believe that we can hear and can work within His timetable and purpose. But we have to be willing to place our desires in the back seat and let God through His Spirit steer this vehicle according to His will. We cannot usher in the Kingdom, but we can actively be part of those two sticks that are drawn close before the Kingdom comes. And in order to do that, our stick must have inner shalom, inner peace or we will continue to profane and disrupt all we are exposed to. The widely shared sense of direction that came out of that first Plenary Meeting in Nashville remains the same today. If we do not correct our mistakes, and join together in the common purpose of unity and the promotion of peace throughout this movement; then we will not take part in the events we all so desire to be part of and witness. The result will be that we wait this out in the wilderness knowing that the next generation will see the Promised Land. Oh Father, help us find that peace! Back in early September, as we began the final 40 days that lead to Yom Kippur, I began to see teshuvah in a completely different light. I made a commitment to reach out to those I knew I had wronged, and also, to those I believe I have been wronged by. This has been more than just another learning experience for me, it has been a humbling life lesson. I have stood before and asked forgiveness from those I know I have hurt. I have also stood before others in an attempt to find shalom between us, letting go of any memory that might have related to how poorly they might have treated me. Like I said, this has been a humbling and yet, somehow, oddly rewarding experience. There is an aspect of teshuvah that I seem unable to satisfy at this time, and sadly, I might never satisfy this weight on my heart. That weight is found squarely on my inability to take the hurt of the Jewish people, a hurt caused by centuries of hostility at the hands of Christians, away. As a man loosely raised as a Christian, I now know that the Jewish people have, for the most part, a very unfavorable view of Christians, Christianity, and Jesus. And why not? Christians over the centuries have treated the Jewish people poorly. Starting early in the second century, various Christian leaders began to shape the paradigm of future Christians by writing about the Jews as if they were Christ killers, deplorable sinners, and a people out of God’s will and without purpose. As time progressed we see a growing lack of respect aimed at the Jewish people coupled with beatings, forced baptisms, and even death. When Hitler came into power, he claimed to be a Christian. Despite him being a poor reflection of the one he claimed to serve, the Jews should not be expected to have to discern who may or may not be reflecting the values of Christianity. Thus, from their perspective, if Hitler claimed to be a Christian, and I claim to be a Christian, then in their eyes, I am not much different than Hitler. The truth is, I am unlike Hitler in many ways but I have no ability to undo the past. Not only do I lack that ability, I really can’t even make an adequate apology to the Jewish people for the wrongs that have been committed against them by those who have come before me. I can’t make right what others have made wrong, all I can do is take a stand for Israel, for the Jewish people, and attempt to reflect the true values and character of the God we both serve. Judah – your God is my God, and your people are my people. While I can’t undo the past, I can offer my respect and understanding and only hope, and pray, that one day this sentiment becomes mutual. And perhaps, as time progresses, others will come to a similar understanding and, in time, reach that same depth of teshuvah. When that happens, we’ll all taste an aspect of shalom that hasn’t been realized since Solomon. Avinu Malkeinu, hear my prayer. I have, we all have, sinned before you. Have compassion upon us and our children. Our Father, our King! Return us in complete teshuvah before you. We ask you to bring shalom to chaos and union to areas of division. May a door of communication be opened between all who belong to you, our King. To you alone be the glory! Amen. ~ The rain fell on the earth for 40 days and nights while the family of Noah were safely aboard the Ark. ~ Moses spent 40 years in Egypt, 40 years in Midian, and then 40 years in the Wilderness. The latter with the rest of the Israelite’s who would not see the Promised Land. ~ The spies spent 40 days investigating the Land promised to Israel. ~ Jonah warned Nineveh for 40 days that their sins would bring about destruction. ~ Ezekiel laid on his right side for 40 days to symbolize the sins of Judah. ~ Elijah fasted for 40 days at Horeb while Yeshua (Jesus) fasted for 40 days and nights before his ministry began. ~ Saul, David, and Solomon each ruled for 40 years. Obviously there are many more examples and one of the most amazing appearances of the number 40 isn’t even found within the text, it is that many believe that 40 different authors were used to write the Tanach (OT) and B’rit Chadashah (NT). That may or may not be true as Moses certainly didn’t record his own death and there are questions about a second author in Isaiah. Regardless, clearly the number 40 has great meaning to the God we serve. The Days of Awe are truly the time when one really digs deep within themselves and seeks to have God reveal to them anything that might indicate where they have fallen short of God’s expectations. It is also a time when one might seek to make right any wrongs we have with one another. Pride is set aside and we walk in pure humility before God and neighbor in a true spirit of reconciliation. These 10 days end at the holiest day of the year, Yom Kippur. This day has always been tied to not only our own sin, but the sins of our nation. It is a time of fasting, prayer, rebuilding, and maturing. It should be that we have been reminded of our sins while being made aware of those things we didn’t realize were sin. We then lay it all out before God cleaning the slate, if you will, before beginning the next annual cycle in our walk. If you did the math above, Elul being 30 days and the Days of Awe being 10, you realize that Friday evening marks the beginning of 40 days that end on Yom Kippur. I doubt that fact is incidental, in fact, recognizing it now almost seems like a call by God to make use of that time in a manner beneficial to not only us as we walk individually before our God, but also beneficial to our community at large. The closer we draw to God, and the more we walk in humility before Him AND our neighbor, the better our community (or nation) will function as a whole. In the spirit of being United 2 Restore, I am suggesting that we all take at least some time out of each of the next 40 days to pray, repent, and reconcile so that we might receive not only forgiveness but also direction for the days ahead. All of us setting aside time each day will mean that as a united body we will stand together daily in prayer, lifting each other up. It also means that as we do this as one people, we will start to draw closer together and truly begin resembling a nation. To borrow part of a verse from Esther 4, if we have “come to the kingdom for such a time as this” then it is time that we collectively begin to act like citizens of that Kingdom. Let us take the next 40 days, beginning on Friday evening, Elul 1, to pray, repent, and reconcile to whatever degree we are capable of. May you be blessed and may HE be exalted! If you are in agreement, I ask you to share this article with others. Shalom to you all! Over the last three years or so, we have been using the phrase, “Revolution for Restoration.” So many people have come to this understanding and are in full agreement that the time is now to draw closer to one another awaiting the day that God makes us one in His hand. But how does one go about a revolution like this? What exactly is expected of each of us? How does this revival of epic proportions even begin? Well, I would be entirely remiss if I didn’t begin by saying that this great revival begins when it is God’s timing for it to begin. We cannot force God’s hand in anything, He alone is God and He alone will do what he has appointed for Himself to do. With that said, the concept of restoration has become so prevalent throughout those who identify as Israel that perhaps this great gathering is closer than we might think? After all, why would so many have such a strong drive to unite with all of God’s Israel when just 40 years ago or less, this wasn’t even a consideration? With His timing seemingly within reach, I find myself influenced by many aspects of Scripture as I consider those questions asked above. To address those questions I offer the following three points for consideration. Perhaps we all might glean something that we can use to discern God’s purpose for us in the days ahead? 1. Cycles of Righteousness – The Feasts of God (see Lev. 23) have been called “Cycles of Righteousness” by various teachers throughout time. The reason is that they run in an annual cycle and they each feature various aspects through which we can learn. They teach about the history that each feast was derived from, they carry a meaning that is relevant to the day in which you live, and they also point forward at work that God would do, in general, through His messiah. In doing this, the feasts reveal aspects of God’s heart and desire for His people as they reveal His righteousness. Since they repeat on an annual basis, they have been called, “Cycles of Righteousness.” The repetition of His Holy Days, year after year, helps to drive home the points being made, keep them fresh on our minds, and allow us to build on what we learned the prior year. The learning truly never ends. For the purposes of this article, I am only going to look at an aspect of the first two fall feasts, Yom Teruah (Trumpets, AKA “Rosh Hashanah”) and Yom Kippur (atonement/ coverture). Yom Teruah is a high Sabbath that marks the beginning of the month of Tishri (generally in September) and traditionally the Jews have viewed this as the anniversary of the first day of Creation. It also marks the first of 10 days known as “the Days of Awe.” It is during these 10 days when one, traditionally, is expected to dig deep into oneself and recall all areas where they might have fallen short not only before God, but before each other. It is also the time when we ask God to reveal those areas where we fell unknowingly short. It is a time to reconcile our differences, repent and go and make peace between one another. We then stand before God at the end of those 10 days, on Yom Kippur, another High Sabbath and perhaps the highest of all, having reconciled any and all differences we had not only with God but with each other. It is a time of individual and national cleansing. Revival can not come, restoration cannot happen, if we stand at odds with our brothers and sisters. God “hates” division among the brethren (Proverbs 6:16-19) and if we love God then we must love what He loves and hate what He hates. And if God hates division, then we must also hate division. Therefore, if we seek revival and restoration, we must take the Days of Awe very seriously and make peace with those we have wronged while repenting of those things we knew… and didn’t know of… before God. 2. Changing the culture – Our congregation has been following a triennial Torah Portion for the last 4 years or so. Last week we brought the book of Genesis to a close and when we did, a realization came to me. Joseph was able, seemingly single-handedly, to change the entire Egyptian culture. As we consider his time in Egypt, we see him begin as a slave with few personal rights. Yet despite all he had gone through in getting to Egypt, he retained a positive demeanor and managed to continue reflecting the character attributes of God. He impresses Potifer, makes an impact on at least one of his jail-mates, and then wins over Pharaoh to the point of being placed above all of Egypt, save for Pharaoh. His decisions and actions save the Egyptian people and through the entire process the Egyptians go from extreme xenophobia to an all out embracing of not just Joseph, but of Joseph and all the Israelites in that land. This is made obvious when Jacob dies, as all the elders of Egypt, including all the elders of Pharaoh’s house, travel with Joseph and his brothers to Canaan to bury Jacob. We even see that the Egyptians mourned over Jacob’s death for 70 days. Joseph changed the culture of Egypt, not so much with words but with actions and a godly character. His walk reflected the one He served, which was Pharaoh perhaps in the flesh, but the God of Abraham, Isaac, and Jacob in his soul. Joseph “walked in the name of YHWH.” This means he walked in a manner consistent with the character and reputation of YHWH and it was that, above all else, that changed the Egyptian culture. This is what happens when our walk does the talking. Words are fine, there are times to answer questions and share truths. But nothing speaks louder than a walk that consistently reflects the one we serve. The the world around us sees God in our actions, and even hears Him in our words, lives are changed. There are more verses like this that extend from loving your neighbor in Lev. 19:18 to Proverbs 25:21 which commands us to feed even our enemies (Paul quotes this in Rom. 12:20). This line of thinking even extends to Yeshua saying, “turn the other cheek” when confronted with an evil person. The theme of these, seemingly; to humble ourselves before all others in a manner that encourages peace. Loving neighbor isn’t exactly the easiest command to follow because sometimes our neighbor isn’t as cooperative as we might like. Yet, God’s will is for us to love them and love is shown, not spoken. Everything that has been shared to this point is dealing with our relationship to not only God but all those we encounter, whether “brethren” or not. Are we willing to humble ourselves before a brother who wronged us for the sake of peace? Can we find it within ourselves to offer food (or meet any other need) to an enemy? Are we able to love a neighbor who abhors us? Is it possible to walk among the strangers without compromising our values or allowing the light of the one we serve to diminish from within us? Can we change the culture we find ourselves in by reflecting the one we serve? Brothers and sisters, I truly believe we are able to take all the correct steps but I also know it will take great commitment, strength, and humility. It all must begin with us on our knees, daily, in order to address our own shortcomings and repent of those areas we have fallen short in. It will take us reaching out to those we have wronged and making those situations right. But even more, it will take a willingness to reach out to those who have wronged us, making peace on our end while praying that they do the same from theirs. It will mean us truly walking Torah as the spirit of Torah has been revealed to us. It is no longer enough to claim we walk in Torah, it is time to let the world see the Torah in our walk. We know what to do, it is time to do it. As the fall feasts approach, I encourage you to take this time to seek the face of God like you never have before. This Revival, this “Revolution for Restoration” begins with each one of us getting right with God and each other. We have an opportunity right here, right now… to become part of the answer rather than part of the problem. And as more and more of us accept the challenge to humbly become part of the answer, then we will change the culture in which we find ourselves and bless the nation of Israel at large to which we belong. This house is being rebuilt one stone at a time, and only through love, peace, and mutual understanding will each piece properly fit. We are all standing at a fork in the road. One path leads to an extended visit in the wilderness while the other leads to the Promised Land. The former really doesn’t take much work, our pride alone almost guarantees a lengthy stay in the wilderness. The latter will take work, it will take great amounts of love, joy, peace, long-suffering, kindness, goodness, faithfulness, gentleness and self-control. In other words, it can no longer be us, me, I… it has to be Him through us or restoration and revival will remain but a dream. A few days before leaving on our 9 week trip to the States and Canada, as I was reading for the hundred plus time Ezekiel 37, I noticed that verse 17, which reads: “Then join them one to another for yourself into one stick, and they will become one in your hand,” is not exactly that way in Hebrew. Examining the injunction “join” I found out that my previous understanding of that word, which was to “connect” them together and to make them one stick, was not the right or correct understanding of “karev” (kof-resh-veth), a verb that actually means to “draw near” or “approach”. Picture the prophet holding one stick in one hand, and the other stick in the other hand, drawing them “one toward the other one”. The verse continues: “so that they will be one in your hand”. The last word translated “one” is a plural “one” – “achadim” (that is, “ones”). As the prophet continues to draw these two closer together, they eventually end up next to one another in only one of his hands. However, they are still two sticks, each distinct and independent of the other, which is to say that they are still two nations and two kingdoms. The next verse actually confirms the idea of the two sticks (“achadim”) in the prophet’s hand, as it reads: “And when the children of your people speak to you, saying, ‘Will you not show us what you mean by these?’” (v. 18 emphasis mine). The reference there to the subject matter of the previous verse points, once again, to plural, “these”, thus telling us that the sons of the prophet’s people (which could refer to the Jews in Babylon) are still looking at two sticks. The Hebrew word is “eleh” (alef – lamed – hey), meaning “these” (and not “this” – “zeh”, zayin- hey). Continuing in verse 19, YHVH says very clearly that He will take the two sticks/trees out of the prophet’s hand and make them “one” – “echad” – in His hand. Thus, if they would have been one (echad) in the prophet’s hand, it would not have been necessary for YHVH to make them one in His hand. The following verse takes us back to YHVH’s word to the prophet: “And the sticks [plural] on which you write will be in your hand before their eyes” (v.20). This statement allows us to envision the prophet with two sticks in one hand, as mentioned above, one next to the other. For them to be in this position, or to get to the point of being drawn so close to one another, major effort or changes will have to take place in both camps, not to mention the need to resolve the disunity that already exists within each respective camp. YHVH’s prophetic declaration and order of procedure are very important to understand: “Surely I will take the children of Israel from among the nations, wherever they have gone, and will gather them from every side and bring them into their own land; and I will make them one nation in the land, on the mountains of Israel; and one king shall be king over them all; they shall no longer be two nations, nor shall they ever be divided into two kingdoms again” (Ezekiel 37:21-22 emphases mine). Here we see the two becoming one stick/nation and kingdom, not only in YHVH’s hand but also in their land. According to the above scripture, the first stage for the house of Joseph/Ephraim was/is to be saved. I believe that that means to be “redeemed” and to be restored to their original identity as the sons of Israel, a phenomenon which has been accelerating from the time that the historic old city of Jerusalem came back into the hands of the nation of Judah in 1967. Next YHVH says that He will gather (kuf-vet-tzadi) them (referring to the dry bones), using the verb “kavetz”, which is seen, for example, in 1 Kings 20:1 as to “gather, assemble or concentrate forces” (such as the dry bones in Ezekiel 37:10). Employing the same verb, Isaiah 60:4 reads: “Lift up your eyes all around, and see: they all gather together, they come to you; your sons shall come from afar, and your daughters shall be nursed at your side”. If the redeemed members of the house of Joseph are going to become a nation in the hand of the prophet, they will have to be gathered first and foremost unto Yeshua their redeemer. Yeshua will then unify them by the oneness of His indwelling Spirit, ultimately into family communities: “Elohim sets the solitary in families… And makes families like a flock” (Psalm 68:6a; 107:41b), and I might add, with seasoned mature recognized leadership/elders (see Jeremiah 23:4). This unity is not conformity to outward or external religious symbols and practices, but is based on the evidence of the life of Elohim’s Son. “And because you are sons, Elohim has sent forth the Spirit of His Son into your hearts, crying out, ‘Abba, Father!’” (Galatians 4:6). The above verse indicates that the nation/stick of Joseph is made up of Elohim’s sons, who are governed by His Spirit. It also points out that the king of this spiritual kingdom is residing in the hearts of His subjects. The government of Elohim is “righteousness, peace, and joy in the Holy Spirit” (see Romans 14:17). We know that Satan will not stand by allowing this restoration to go forward. He will work through the power of sin, which is in our flesh, to bring forth the unloving nature of his kingdom of darkness. When he gains a measure of success in these efforts, we may become what YHVH hates, that is, “a false witness who speaks lies, and one who sows discord among brethren” (Proverbs 6:16,19). The power of sin is the next most powerful force to Elohim’s. The only authority that has already defeated the nature and power of Satan’s is the wisdom of Elohim, which is the word of the execution stake. “For the message/word of the cross is foolishness to those who are perishing, but to us who are being saved it is the power of Elohim” (Corinthians 1:18). “Elohim is faithful, by whom you were called into the fellowship of His Son, Yeshua the Messiah master and king. Now I plead with you, brethren, by the name of our Master Yeshua the Messiah, that you all speak the same thing, and that there be no divisions among you, but that you be perfectly joined together in the same mind and in the same judgment” (Corinthians 1:18). This is not necessarily referring to what we do, but to what we believe to be true about the Father’s finished work through Yeshua’s death, burial and resurrection. Next time, Yah willing, we will explore what that might look like. In the meantime watch and pray, for the devil, with his wiles, is always looking to use us (our flesh) to abuse ourselves and others. But the love of Elohim is in our hearts in order to encourage and build us up and others in faith, hope, and love. There are many parts to His body, and we all may have a different leading as to what He is doing to accomplish His purposes, but that is a matter of the heart, which only He knows. Some may want to serve together in a framework of an organization, others feel to do it another way, again, according to the way they feel led. But none has the right to judge what is in the heart of another. We all have the privilege of forgiving one another when necessary.